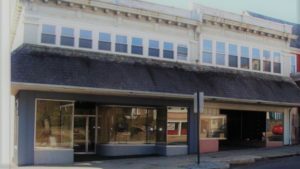 If you’ve been keeping up with Souderton news this past year, surely you heard that there were competing bids for the building adjacent to the old Broad Street Theater. In the fall of 2017, Barbara Smith and Davood Sowhangar each placed a bid on the property. Sowhangar, owner of Broad Street Pizza, submitted a proposal to relocate his business to the property and offer commercial and residential rental units. Smith, owner of Ark Animal Hospital, proposed an indoor market and restaurant space. Smith’s proposal garnered attention from all over Souderton and surrounding towns. Many residents expressed their wish for more community spaces in town. At the November Borough Council meeting, the vote went narrowly in favor of Sowhangar’s larger offer. While many in the Souderton community were disappointed with the outcome of the vote, Borough Council members stressed their responsibility to the taxpayers in voting for the higher bid. Shortly into the new year, I discovered that Barbara Smith, Bea for short, was not to be deterred from her dream. When the news came out that Bea had purchased 142 N. Main Street in Souderton, my excitement for her indoor market was re-kindled. I gave Bea a call to find out more about how she developed this vision and what her plans are for the property’s development. Bea grew up in Jersey City, where everyone could head into the center of town for anything they needed. 20 years ago, with a veterinary practice in California, she dreamed of having a Main Street office. As it turns out, Bea was ahead of the times. Around 2004/2005, the national Main Street resurgence began. Small towns began adopting the First Friday trends of the big cities, and Main Street revitalization programs cropped up around the country. Bea finally got her Main Street vet practice right here in Souderton about 5 years ago, and she quickly took an interest in her new community. Bea knew about Souderton’s revitalization efforts, and she discovered the disappointing outcome of the Broad Theater project. She got busy researching the best way to breathe new life into a town, and the answer was clear: build a marketplace. Bea was interested in the building she ultimately purchased before she ever knew about the Broad Street property. She was encouraged to bid on the property next to the theater, and so she created her proposal. Even though she wasn’t awarded the bid, she was energized by the community support for her project, and she went back to the owners of 142 N. Main Street with an offer. Her offer was accepted, and now she is in the planning stages with her business partners to make her dream a reality. Bea hopes to be open by spring of 2019. During the zoning and construction phases, she plans to work tirelessly to fill her vendor spaces. She would like to find vendors who offer ready to eat dishes and beverages. She envisions a winery stall with a tasting bar, high end chocolates and desserts, empanadas, Asian fare, and hopefully a hot dog stand that will remain open late at night. While she plans to offer space for a small convection oven or two, there will be no major cooking equipment such as pizza ovens or grills requiring exhaust fans. She will also seek a few packaged food vendors, who will sell products like sauces, butters and spreads, olive oil and vinegar, and other specialty items. Bea’s layout is projected to have 3 rows of vendors, many with counter space and seating, as well as central court seating. These tables will allow the community to mingle and gather throughout the day. Bea believes that the small footprint per occupant will eliminate much of the overhead that prevents small businesses from taking off. There may even be an opportunity for several vendors to co-op points of sale and share the labor. Souderton is on the rise. Bea is working hard to bring a marketplace to her new hometown, where community can come together on a daily basis. At Play It Out, our mission is live social interaction, so we stand behind Bea and her project 1000%. We will be watching this development over the next year, and we’ll be sure to report any exciting updates! Looking forward to this terrific idea. Great blog post and props to Bea for sticking with her dreams! This will be a fabulous addition to our growing Main Street family. The artists at Art on the Hill look forward to additional lunch options close by!